Heathrow Airport celebrated its 70th anniversary this week with a series of special events. Seventy plaques have been unveiled across the airport and photos of Heathrow from the last 70 years have also been released, showing a new side to the UK’s only hub airport and how it began officially operating as London Airport on 31st May 1946. The airport has hosted many memorable moments including in 1952 when the former Princess Elizabeth stepped onto UK soil for the first time as Queen- her father, King George VI, had died while she was touring Kenya. The airport has also welcomed the Beatles back to the UK after their first world tour in 1964 and the England rugby team arrived from Australia as World Cup winners in 2003. It all began during World War II when the government requisitioned land around the ancient village of Heath Row to build a base for long-range military aircraft. The first commercial flight, on 28 May 1946 by Lancastrian G-AGLS Nelson, took 63 hours to reach Sydney. The first terminals were marquees on Bath Road, equipped with fresh flowers, comfy sofas and Heathrow’s first retail store – a WH Smith. By 1951 Heathrow was welcoming 796,000 passengers a year and designs were drawn up for a red brick control tower, a passenger terminal called the Europa Building and an office block called the Queen’s Building. Terminal 1 opened in 1969, by which time five million passengers a year were passing through the airport as the jet age arrived. Demand for air travel created the need for Terminal 4 which opened for business in 1986 before Terminal 5 opened in March 2008 (below). In 2014 Terminal 2 opened which marked the latest phase of an £11 billion private sector investment that has transformed Heathrow. Heathrow has progressed hugely over the past 70 years but further changes are needed if it is to thrive in the next 70 years, not least because its two runways are full. In 1949, 400,000 passengers travelled through Heathrow but in 2015 that figure had risen to 73 million. That’s why we at Back Heathrow continue to campaign for Heathrow to be expanded so that it is bigger, better and equipped to succeed in the future. Onlookers in central London may have been rubbing their eyes in disbelief as a giant white elephant passed them on Wednesday. The elephant – full name ‘Gatwick 2nd Runway’ – was nattily dressed in Biggles-style flying cap and goggles as he made his way around Parliament Square, passing the Houses of Parliament before flying down Whitehall. The Gatwick White Elephant passed the Prime Minister’s Downing Street residence and also made a flying visit to City Hall, soaring over Tower Bridge. It was all a bit of fun that we at Back Heathrow hope makes a serious point and sends a clear message. We wanted to demonstrate why a new runway at Gatwick risks becoming a white elephant if it is not used by major airlines. Many want to use an expanded Heathrow but are prevented from doing so as it is already operating at full capacity, unlike Gatwick. BAR UK, a trade organisation representing over 70 scheduled airlines operating in the UK, has stated that: "The majority of BAR UK airlines have maintained their view that expansion at the UK’s existing hub airport, Heathrow, provides the most compelling solution [to a lack of aviation capacity]." The UK desperately needs additional aviation capacity in the south-east and the answer has always been to expand at Heathrow. It is the clear and unanimous choice of the independent Airports Commission; MPs, airlines and major UK business groups all prefer Heathrow expansion over Gatwick; Heathrow is operating at full capacity with more than 30 airlines wanting access; and airlines often move from Gatwick as soon as slots at Heathrow become available. It makes the most sense to expand at the airport where demand is highest and that means in West London not West Sussex. Building a new runway at Gatwick risks building an expensive, giant white elephant that may sit underused because airlines would still prefer to fly from Heathrow. The government has acknowledged that the UK needs additional air capacity in the south-east but for far too long it has dragged its heels over making a decision. It’s time to make that decision and it’s time to expand Heathrow. This week’s announcement by Heathrow Chief Executive, John Holland-Kaye that Heathrow will meet and exceed the conditions laid down by the Airports Commission is great news for anyone interested in the future prosperity of west London, the Thames Valley and the whole of the UK. Our country has been plagued by indecision on airport expansion in the south east for months, years and even decades but this important announcement will help sweep away the barriers to finally building a vital new runway. The news is a tribute to supporters of Back Heathrow and to the positive way they have conducted themselves during this campaign. Our supporters are local people who care passionately about their communities and want them to thrive and prosper in the future. They are united by a desire to see local jobs protected and Heathrow’s future secured. The government has long known why Heathrow is the answer to Britain’s aviation capacity problem; a new runway at the UK’s only hub airport will offer new flights to emerging markets, protect existing jobs and create 77,000 new jobs and thousands of apprenticeships in the local area. It was the “clear and unanimous” recommendation of the independent Airports Commission – set up by the Prime Minister. But Heathrow’s new announcement takes the process to the next stage and strips the government of any lingering excuses for not supporting a new runway. Even anti-expansion campaigners said Heathrow had “gone further than expected” and that the move “could turn out to be significant”. Click here to view full details of Heathrow’s announcement. As the UK’s largest port, a successful Heathrow is vital to the health of British economy - it is the only way to connect all of Britain to global growth and the only way to guarantee its future success is to expand. With these new commitments in place Heathrow has passed the test of balancing the huge economic gain from expansion with the local and environmental impact. The case for a new runway at Heathrow is overwhelming; it’s time to get on and build it. When is 53% not a majority? When is it wrong to say 50% over 33% means 'most people support something'? And the answer to both questions is... when it comes to campaigning for Heathrow expansion. At least, that is the view according to the Advertising Standards Authority (ASA) which last week controversially banned one of our adverts following complaints from a handful of anti-expansion campaigners. The full ruling can be found here. The ASA ruled that we cannot use the phrase: 'Most people living in communities near Heathrow Airport support its expansion' - mainly because 50% is not 'most people'. Ironically, if we had used the phrase 'More people living in communities near Heathrow Airport support its expansion than oppose it', this would have been OK. Evidence clearly shows that in a major independent poll of 12 parliamentary constituencies, 50% of local residents support Heathrow expansion whilst 33% remain opposed. But what makes the ASA decision truly confusing is the fact that based on the ASA's own definition of what constitutes 'near to Heathrow' no fewer than 53% of local residents back a new runway. It is highly likely that most people (!) won't care about the technical detail but the ruling will still stand, we think, unfairly. The reaction of a small but increasingly vitriolic number of anti-Heathrow protestors to the ruling is exactly why the Back Heathrow campaign is needed. They despise the fact that we are giving oxygen to an alternative view - one backed by huge numbers of local residents - when for too long they have had the floor to themselves. We are shattering the myth that it is always 'big business' v 'little residents' when it comes to major infrastructure projects - and our opponents, spearheaded by well-organised and determined green fanatics, do not like it one little bit. In the recent Airports Commission public consultation, 82% of the 70,591 responses were in favour of Heathrow expansion. Most of these were local residents so we think the ASA is on wafer-thin ice with its ruling. More local people support Heathrow expansion than oppose it - that's a fact. And our new adverts will prove it. The aviator glasses glinted in the spring sunshine as a bouncing crowd of Back Heathrow supporters wearing yellow flight attendant hats gathered outside the Houses of Parliament on Wednesday. Living near Heathrow airport, these residents came to central London for a fun campaigning day with a serious message. We were in Westminster to launch our new Captain Cameron campaign and to deliver a letter to the Prime Minister on behalf of 100,000 local residents who want a positive decision on Heathrow expansion and no more delay. Campaigners were joined by special guest Captain Cameron, in full pilot uniform, to call on ‘Captain’ David Cameron and ‘First Officer’ George Osborne to land Heathrow expansion and watch the UK take off. The letter urges the Prime Minister to end the uncertainty surrounding airport expansion and give the green light to a new runway at Heathrow. It refers to the £211bn economic benefits and 180,000 jobs up and down the country which would come with Heathrow expansion. The letter also asks why the Prime Minister would risk huge protests in an unspoilt area of rural England by backing expansion at Gatwick, an option for which there is little support. Captain Cameron was in high demand for photographs from tourists and passers-by but there was no time to waste before we headed off to the Department for Transport to deliver a letter to Secretary of State, Patrick McLoughlin, asking him to back Heathrow expansion and end the uncertainty for residents living near the UK's hub airport. Our day in Westminster was hugely enjoyable and served to remind the Prime Minister that despite the looming EU referendum, the pressing matter of Heathrow will not go away. This was a final call for Captain Cameron. The Prime Minister now needs to show real leadership to land Heathrow expansion. A new runway at the UK’s only hub airport can be approved with confidence because it is backed by most local residents living near the airport, businesses, exporters, airlines, trade unions, regional airports and a majority of MPs. It’s been a long-haul but there must be no more delays. The European referendum has been dominating news coverage as politicians, as well as the rest of us, decide whether to back remain or leave. The current political focus on debating the pros and cons of EU membership means that David Cameron has delayed the decision on expanding Heathrow – a damaging action which is costing our economy millions. However, it was interesting to see the Prime Minister kick off his EU campaign at O2 in Slough. O2 is one of many top companies backing Heathrow whilst Slough is home to more headquarters of multinational companies than Scotland, Wales and Northern Ireland put together. They are there because of Heathrow. As he talked up the importance of trade and business in the EU, the Prime Minister will have been aware that the local MP, council and most residents in Slough support Heathrow expansion. Heathrow chief executive John Holland-Kaye made clear his view on the EU debate this week saying: "A vote to remain offers the best of both worlds – it secures our place as a powerhouse in the global economy, while remaining in the world’s largest free trade zone.” Yet he also warned that a Brexit would make a new runway even more urgent. Heathrow clearly has a global reach but it is also well connected to European destinations. Heathrow handles over 1.5 million metric tonnes of cargo every year and over 200,000 passengers every day. It employs 76,000 people within the airport boundary (equivalent to the population of Guildford), and as the UK’s largest port responsible for a quarter of all exports from the UK by value, Heathrow is well placed for the future no matter what the referendum result. But running at 98.5% capacity, it must expand. Back Heathrow has over 100,000 supporters across West London and the Thames Valley. Clearly there will be different views on the UK’s role in Europe amongst our supporters but what unites us is a desire to see local jobs protected and Heathrow’s future secured. The Government already knows that a new runway at the UK’s only hub airport is the answer to the problem of airport capacity in the south-east. Extra capacity at Heathrow will offer new flights to emerging markets, protect existing jobs and create 77,000 new jobs in the region. These include 10,000 apprenticeships from the boroughs neighbouring the airport which would help eradicate local youth unemployment. In total, 180,000 jobs will be created across the UK and the benefits to the country are worth £147 billion. What we all need to do over the coming weeks and months is to keep banging the drum for Heathrow so that once the EU referendum is over and David Cameron finally sits down to make his decision on airport expansion, he knows that there is only one answer. And he will be warmly welcomed back to Slough when he chooses Heathrow. A new year brings new opportunities and all of us who back Heathrow expansion have reasons to be optimistic in 2016. The government’s decision not to make a decision in December was obviously very disappointing, but polling shows that the majority of MPs from across all parties consistently back building a new runway at Heathrow. Clearly there is a desire and a will within Parliament to make Heathrow expansion happen – now the Government needs to get on and do it. According to the latest ComRes poll, 68 per cent of Conservative MPs and 66 per cent of Labour MPs support expanding Heathrow whilst all MPs are twice as likely to say they strongly support a new runway at Heathrow than a second one at Gatwick. The majority of MPs also disagreed that an additional runway would prevent the UK from meeting its emissions targets. This high level of support from politicians from across the political spectrum demonstrates that not only is expanding Heathrow economically essential, but also politically deliverable. Some of the most high-profile anti-Heathrow politicians have had an uncomfortable couple of weeks over Christmas and the New Year; from Mayor Boris Johnson’s hypocrisy at investing £3.5 million of GLA public money in Heathrow despite being a well-known opponent, to Zac Goldsmith’s controversial comments which wrongly linked the Volkswagen emissions scandal with Heathrow air quality. While Heathrow opponents flounder, support for expansion continues to soar. As well as huge political support from across all parties, Heathrow expansion is also backed by UK businesses, large trade unions and most local residents. Indeed, 82% of the 70,591 responses to the Airports Commission public consultation backed Heathrow expansion and most of those were from residents who live near the airport. These local people are proud of their airport and want to see it thrive in the future. They know that expansion will create 77,000 new jobs in the region, including 10,000 apprenticeships from the boroughs neighbouring the airport which would be of enormous social and economic benefit to the local community. 2016 will bring a new set of challenges in the battle to provide greater capacity at Heathrow. But two of those challenges shouldn’t be demonstrating local support or political will for building a new runway; both of these have been repeatedly and overwhelmingly proven already. It’s Heathrow…obviously. Now the Government must actually take the decision. The airport battle to build a new runway looks set to continue for the next few months, delighting no-one except advertising agencies. Despite a unanimous recommendation from the UK Airports Commission to build a new runway at Heathrow, the Government has delayed making a decision. By putting a final decision beyond the London Mayoral elections in May, the Conservatives are trying to avoid giving Zac Goldsmith a headache. The Government claims there is a need to carry out further environmental studies but this is doubtful because any environmental concerns – which the Airports Commission insists are surmountable - can be fairly assessed during the planning process. This would be undertaken by means of the independent Environmental Impact Assessment which applies to any national infrastructure project. There was widespread anger from politicians, business groups, unions, international airlines and residents who back Heathrow expansion. Yet the Government’s decision not to make a decision also infuriated residents living near both Heathrow and Gatwick who would be directly affected by any new runway. All of the above need certainty – surely it was the least the Government could provide? The Airports Commission has been clear in its recommendation that a new runway be built at Heathrow. The Government should follow up on this recommendation and expand Heathrow with strict environmental conditions attached so that local communities, as well as the whole country, can benefit. Heathrow is a vital asset for communities in West London and the Thames Valley. It’s not surprising that so many local people want to ensure Heathrow flourishes in the future so that it remains the UK’s premier airport, able to match its foreign hub competitors. In the Airports Commission public consultation earlier in the year, 82% of the 70,591 responses backed Heathrow expansion, mostly from residents who live near the airport. And a recent Populus poll of more than 12,000 residents in the constituencies and boroughs close to Heathrow found many more residents (50%) supported Heathrow expansion than opposed it (33%). People in the local area are rightly proud of the airport and those that work there are particularly proud that Heathrow carries 78% of the UK’s long-haul flights, a quarter of UK exports by value and is our country’s largest port. But Heathrow is operating at full capacity and it has to grow to meet demand. The UK’s only hub airport is the front door to Britain yet it is closed to new business. The risks of not expanding are huge. New flights will operate from a different hub airport abroad that has spare capacity, like Paris, Amsterdam or Madrid. As if to illustrate that very point, British Airways boss Willie Walsh announced that he would pull BA out of Heathrow if the Government continued to dither over expansion. Investment, jobs and export opportunities for the local area and across the UK would be lost and could cause irrevocable long-term economic damage. Heathrow is already the UK’s largest single site employer. It provides more than 114,000 jobs in the local community whilst a further 250,000 jobs in the wider region rely on a thriving Heathrow. An extra runway will also create 77,000 new jobs in the local region, including 10,000 apprenticeships from the boroughs neighbouring the airport which would help eradicate local youth unemployment. In total, 180,000 jobs will be created across the UK and the benefits to the country are predicted to be worth £211 billion. That’s some prize for a Government looking to prove it is on the side of hard-working people. So, there is still a golden opportunity to secure the jobs and investment for the local area that will come from expanding the UK’s only hub airport. But at some point soon, the Government must bite the bullet and actually take the decision to expand Heathrow. 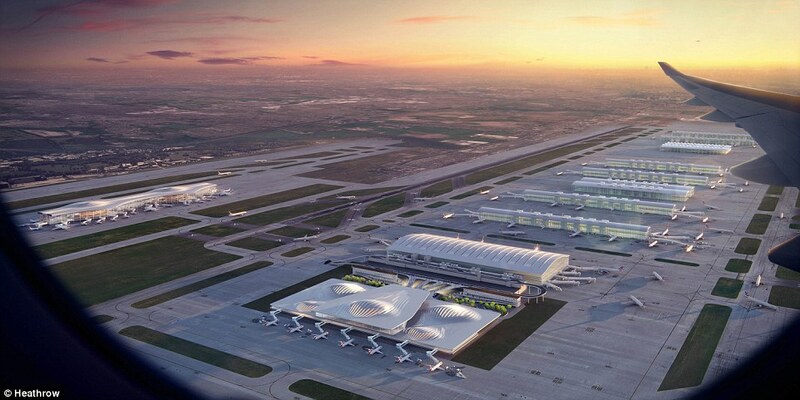 You might be forgiven for thinking that following the strong Heathrow recommendation by the Government-backed Airports Commission the future of the UK's only hub airport has been resolved but that is not yet the case. Following the report, the Prime Minister announced that the Government would provide a response by the end of the year, something that we keenly anticipate. In the meantime, this has not stopped a great deal of debate in the media and at political events during the past few weeks. This is a welcome boost for our campaign and a reminder that the Government is well aware of the urgency and importance of pressing ahead with a decision. Whilst the Chancellor made clear that he wants to get going on important infrastructure projects like Heathrow, the Prime Minister has had more than 50,000 reminders of how important this runway is to local people. Last month, a group of Back Heathrow supporters paid the Prime Minister a visit at 10 Downing Street to deliver some of the 50,000 postcards that have been sent by our supporters urging him to back a new runway. With this and the unanimous backing of the Airports Commission, UK businesses and most local residents, the Prime Minister now has everything he needs to say YES to a bigger and better Heathrow. But what of Heathrow's opponents? Those opposed to expansion have also been busy, setting up a ‘Coalition Against Heathrow Expansion’ made up of just eight MPs (out of 73 in London and 650 nationally). They have sent out 1.6 million leaflets to households across London. These leaflets claim to show areas that “could be impacted” by expansion before admitting in small print that the maps shown are not indicative of final flight paths, and have been delivered as far away as Tower Hamlets in east London. The leaflets also encouraged residents to attend what was billed as “the biggest rally ever” in central London on 10 October. This rally was designed to show off the ‘huge’ support against Heathrow expansion, and it had certainly been built up as a major display of force. Zac Goldsmith MP for Richmond Park had previously spoken of a ‘one-million-strong’ army of Heathrow opponents, and a campaign “the likes of which has never been seen before”. Meanwhile, Windsor MP Adam Afriyie promised that 15,000 people would rally against expansion from his town alone. But come the day, just a few hundred people turned out to protest in Parliament Square. This protest followed a similar anti-expansion event in March, which was again billed as ‘the biggest rally of the year’, but gathered only around 300 people, despite expectations to fill the 600-seat venue. This is not to detract from the valid concerns those protesting may have, but it raises serious questions about whether the level of opposition to Heathrow expansion has been exaggerated for so long, it has become part of the media narrative. Make no mistake, for a small number of people, the effects of Heathrow expansion will be significant, and their concerns must be listened to, and properly addressed. The airport has an absolute duty to treat those worse affected with the greatest of care and fairness. Heathrow also has a responsibility to continue to reduce noise and pollution if it wins the expansion argument. It will soon be time for David Cameron and his Government to make a decision on Heathrow expansion. People on all sides of the debate now require certainty so they can plan for the future.The Prime Minister will see that 82% of the 70,000 responses to the Airports Commission public consultation were in favour of Heathrow expansion, and he will know that there is wide cross-party support in Parliament for Heathrow to grow. There will never be a better time to give a green light for Heathrow expansion. Given that the Prime Minister set up the Airports Commission it will be an extraordinary U-turn for Mr Cameron to then ignore its recommendation.